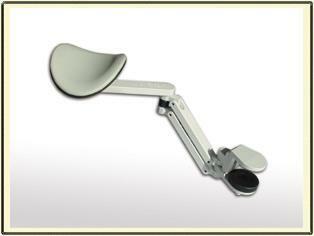 ERGOREST support is lightweight and easy movable. The support is made of aluminium alloy and polyamid, the pad is upholstered with genuine leather. The forearm support will be attached to table top by adjustable clamps. It also has a height adjustment screw. The maximum operating span for the standard model is 235 mm/9.25 in, maximum load is 12 kg/26 lb, and the height adjustment is 75 mm/2.95 in.